The cost of living continues to rise as does the cost of attending college. The expenses of living and going to school have a great impact on college students. 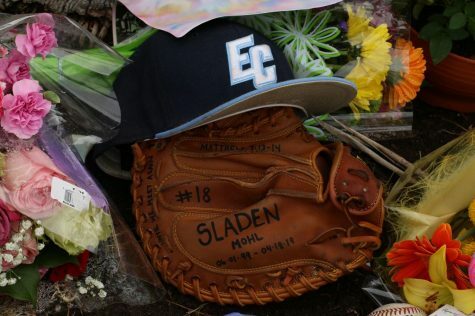 One common factor that usually determines whether a student attends a 4-year university or a community college, is not grades or extracurricular activities, it is money. Students often choose to attend a community college due to financial reasons. One way students can receive additional funds is through financial aid. Students can receive financial aid through multiple ways including, grants, scholarships, and student loans. 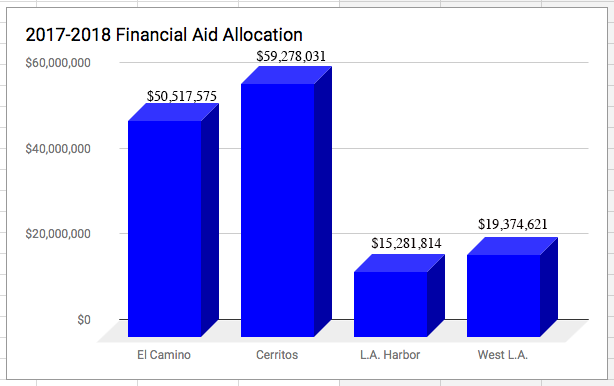 To get a better sense of El Camino’s financial aid budgets within the last five years, take a look at other schools like Cerritos College, West L.A. and L.A. Harbor. 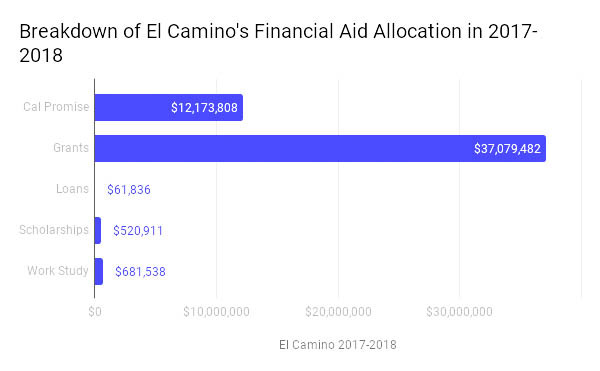 Over the past five years, El Camino has allocated the most financial aid in the 2017-2018 school year at $50,517,575, according to the CCCCO website. Federal work study was at a high (324 students), 44 more students than the previous high in the 2016-2017 school year. The financial aid application process, or FAFSA, could be difficult and confusing to navigate through. The application process constantly goes through changes that could further complicate it. Students should have options when it comes to getting additional funds and should not rely on one source of funding. 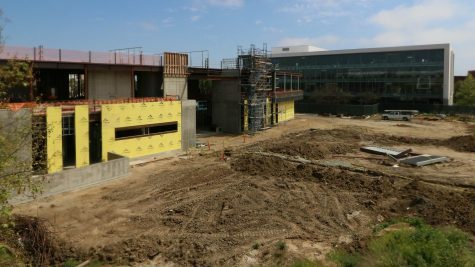 On average, over the last five years $47.7 million has been dished out to El Camino students, according to the California Community Colleges Chancellor’s Office website. The California Community College system is the largest of higher education in the country. The California Community Colleges Chancellor’s Office (CCCCO) is the home for anything related to the 115 community colleges in California. The $47.7 million on average over the past five years is accumulative of the California Promise Grant, other grants, loans, scholarships, and federal work study. The California Promise Grant was formerly the BOG Fee Waiver. 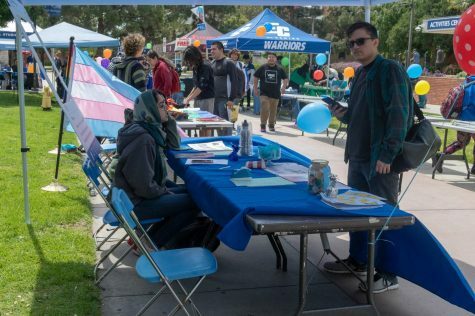 The Cal Promise Grant authorizes that enrollment fees be waived. Essentially, the Cal Promise Grant covers the cost of class. Grants are arguably the best cast of financial aid because it is free money that you do not ever have to pay back. Grants are an umbrella term because they can be branched out into different types of grants. The most known are the Federal Pell Grant and the Federal Supplemental Educational Opportunity Grant (FSEOG). The Federal Pell Grant is the largest source of funded grants. They are dished out solely on financial needs, grades and other activities do not factor. The Federal Supplemental Educational Opportunity Grant assist low-income students who need a great amount of financial aid to help pay for college. The ideal financial aid situation would not include student loans. However, in reality most college students will have to take out student loans at one point. There are two main forms of student loans for undergraduate students, direct subsidized loans and direct unsubsidized loans. Direct subsidized loans are made to eligible undergraduate students based off of their financial need to cover the costs of college. Direct unsubsidized loans are loans eligible for undergraduate, graduate, and professional students. In unsubsidized loans students can take out as much money as they want or need, just keep in mind loans are money that you have to pay back with interest. Scholarships are like grants, money you do not have to pay back. 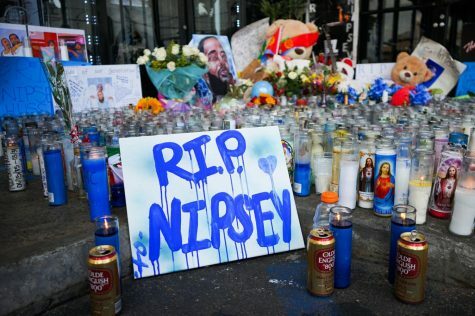 Scholarships can be based off student’s skills and abilities or they can be targeted for a certain group of people. For example, a student can be awarded a scholarship simply because they are left-handed. There are thousands of scholarships given out by schools, employers, private companies, nonprofits, communities, religious groups, and professional and social organizations. For the most part it is the student’s job to go out and find them if they want them. Federal work study provides part-time jobs for students with financial needs, allowing them to earn money to cover education expenses. Only six students needed student loans, that is the lowest at El Camino in the five year span. Grants also peaked at a high of $37,079,482 but the student count was only in the middle of the pack. Cerritos is the better school to compare financial aid allocations with El Camino because they are similar in population size. El Camino’s comparable school is Cerritos and West L.A.’s comp is L.A. Harbor. Cerritos student population is slightly higher than El Camino’s but not significantly higher. 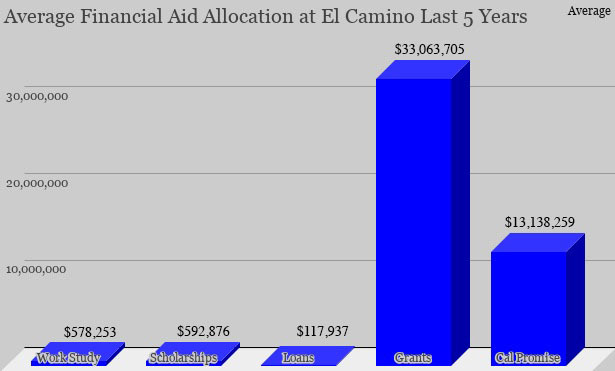 El Camino’s average final financial aid budget in the five year span is $47,745,629 and Cerritos is $60,349,162. El Camino’s average student count is at 17,911 students and Cerritos’ average student count is 19,924 students. The final allocation of financial aid for El Camino in the 2017-2018 school year was $50,517,575 with a student count of 17,401. This translates to roughly $2,903 per student that receives some type of financial aid at El Camino. The Cerritos final budget for the 2017-2018 school year was at $59,278,031 with a student count of 18,553, $3,195 per student that receives financial aid at Cerritos college. The final amount of financial aid allocation from L.A. Harbor in the 2017-2018 school year was $15,281,814 with a student count of 7,820. An average L.A. Harbor student with financial aid receives about $1,954. West L.A.’s student count was 13,123 in the 2017-2018 school year. The final allocation was $19,374,621, an average $1,476 per student who receives financial aid. According to the CCCCO website, West L.A. students did not receive scholarships in the 2013-2014 school year and from 2015-2016 through the 2017-2018 school year. The only school year West L.A students receive scholarships waa 2014-2015, which was only five. 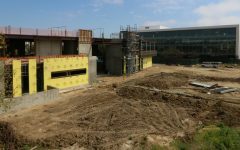 Cerritos led all four schools in the amount of loans taken out each year. During the five year span, on average Cerritos students take out 814 loans. None of the other four schools average 300 loans per year. At El Camino there are countless number of scholarships that are available that go unapplied for. To apply for scholarships at El Camino, go to myecc and click on the ‘Scholarship Application’ to fill out. Financial aid means a great deal to students as it may allow students to strictly focus on school. “Yeah, it [FAFSA] helps out a ton, knowing I have that money for myself I can just focus on my classes,” Jorge Pena, 19, psychology major, said. Financial aid can also cover small, typical purchases. “I only have to worry about school and can just use that money for what I need like gas and food,” Nick Huitron, 18, business major, said. 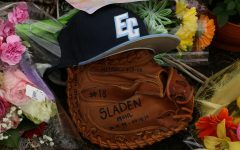 Financial aid will continue be an importance piece of a student’s situation and applications maybe difficult for students who aren’t familiar with the application process. For those students who need help completing their first FAFSA application, counselors or college financial aid officers will serve excellent resources. It is important to fill out the FAFSA applications as soon as it is available and to follow directions carefully so there won’t be any delays in the application process.